Our incredible selection of luxury Hawaiian Villas range from luxurious beachfront villas to secluded private homes with luxury rooms nestled within this tropical haven. During your stay will have a profusion of adventurous activities to indulge in and exciting new places to visit each day. You will never run out of things to do here while living a truly exceptional Hawaiian dream. There is nowhere on this planet quite like the breathtaking islands in Hawaii. There are 8 main islands across the map in Hawaii; Niihau, Kauai, Oahu, Maui, Molokai, Lanai, Kahoolawe and Big Island. They are located in the middle of the Pacific and an interesting fact about Hawaii is that they are the most isolated population centre on the planet. Hawaii is one of the most popular holiday destinations and for very good reason. Each of the islands are quite unique but what they do have in common is that they are all stunningly beautiful. Endless beaches caressed by turquoise seas, verdant rainforests, soaring volcanoes, cascading waterfalls, an abundance of sweet smelling scents that float in the air and incredible sun rises and sunsets. Hawaii also has an extremely interesting multicultural heritage. The islander’s ancestors comprise of Asian Immigrants, European Explorers, American Missionaries and ancient Polynesians. As a result, they have a wonderful and thriving cultural scene which may be witnessed throughout the islands. This includes the famous hula dance and a wonderful, content laid-back attitude to life which is often found in other parts of the world. Exceptional Villas have handpicked all the best luxury Hawaii villas and properties for you, our guest, concentrating on four main islands of Kauai, Maui, Oahu and Big Island. Now it’s time to take a closer look! Our Maui Vacation Rentals are some of the nicest homes and luxurious accommodations on the planet, all of which boast incredible views and private pools. Some of our Maui Villas are located high up on the mountain tops offering an expansive view of the Volcanoes and Sea. More of the villas can be found directly on the ocean providing magical sunsets and spacious exteriors. Guests love this island in Hawaii, especially families with children as there is so much to do from zip-lining to snorkelling and windsurfing. For adventurous travelers seeking a new fitness experience you can enjoy an incredible hike up the 10,000-foot summit of Haleakala volcano or some fun mountain-biking. Maui is an incredibly beautiful location and is a destination that has won many travel awards. The beaches are pristine, the ocean waves roll, waterfalls tumble and there is no better place on the planet to watch the sun rise than from the peak of Haleakala. Maui is also sometimes known as the Valley Isle. There are many areas to explore with charming small towns, fabulous restaurants and a great culture. It is also one of the best islands to enjoy watching the humpback whales in season. Big Island is Hawaii’s largest island and is home to one of the world’s most active volcanoes, Kilauea. The island can provide the four classic elements of wind, water, earth and fire all in the one day. If you are lucky enough you might see hot lava flowing into the ocean next to black rock cliffs. Its landscape is truly unique, here you will find lava desserts, lush rainforests, exotic jungles, black sandy beaches and even snow-capped mountains. Big Island is also very cultural and offers many historic sites worth visiting. There is so much to do from site-seeing to activities including some of the best golf in Hawaii. We have a selection of Hawaii villas along the Kohala Coast in Big Island, many of which can be found in our luxury Hawaiian Resorts. As its name describes, Big Island is BIG! It is the largest island that is part of the United States and measures 93 kilometres across and covers a land area of over 10,000 square kilometres. It has an incredible range of climate zones which in turn create extraordinary landscapes that include snow-capped peaks, white sandy beaches, deep forests and lava deserts. It is astonishingly beautiful, and the people are wonderfully friendly; a perfect mix. We have a lovely selection of Hawaii villas along the Kohala Coast in Big Island, many of which can be found in our luxury Hawaiian Resorts. Oahu is another island of Hawaii that offers luxury Hawaii villas and vacation rentals. It is one of the most populated islands. The island is home to the capital Honolulu, where you will find world-class shopping, exciting nightlife, relaxing Hawaiian spas, fun bars and clubs, luxurious villas, hotels and resorts as well as the most famous Hawaiian Beach Waikiki Beach. Honolulu city features historic Chinatown and the Punchbowl, a crater-turned-cemetery. West of Honolulu is Pearl Harbour, site of the WWII's 1941 bombing attack and home to the USS Arizona Memorial. Oahu offers guests the chance to see its wonderful historical sites and provides an endless supply of incredible scenery with lots of activities to enjoy. Surfers seeking the world’s best waves will find their paradise here on the Oahu’s famed North Shore. The North Shore attracts professional surfers from all over the world. One of the main attractions of Oahu is the surfing. Whether you are a participant or just an onlooker, it is fabulous. Oahu is also the birthplace of Barak Obama. Oahu is probably most like the United States than the other islands, but it differs in its atmosphere and culture which is unbelievably laid back, carefree and relaxed. Parts of Oahu are also stunningly beautiful with gorgeous beaches, great waters and lots of nature to enjoy. Kapalua is another one of Hawaii’s captivating land that is known for its luxurious white sandy beaches, glimmering Pacific waters and lush volcanic peaks. Kapalua is an exclusive location and has and array of sophisticated activities like golf, tennis, water sports such as snorkelling and tropical life to explore. Here you can climb to the peak of the Haleakala volcano and take in the spectacular views of the crater and the area surrounding you. Enjoy the perfect Hawaii vacation here. If you want a taste for a more historical location, then you can visit the enriching area of Lahaina. It has over a thousand years of rich history and was the capital of the Kingdom of Hawaii from 1820 to 1845. Not only is this land full of vibrant historic sites, Lahaina also has stunning beaches such as Kaanapali Beach, fine dining restaurants, and an abundance of amenities for you to enjoy. Kauai is the fourth island of Hawaii and is known as the Garden Island. Kauai is Hawaii's ultimate tropical paradise; the island has some amazing natural wonders to explore, from the cliffs of Napali Coast to the amazing view of Waimea Canyon. Sun worshipers love this island with more than 50 miles of beaches to enjoy. Thrill seekers also love the island where you can enjoy hiking, snorkelling and kayaking tours through the natural beauty of the island. Hiking in the Kalalau Trail on the Na Pali coastline is a must. Kauai's Wailua River is the ideal place to kayak to a cascading waterfall. Kauai also offers guests the chance to experience life on a sugar plantation at Grove Farm Homestead Museum. 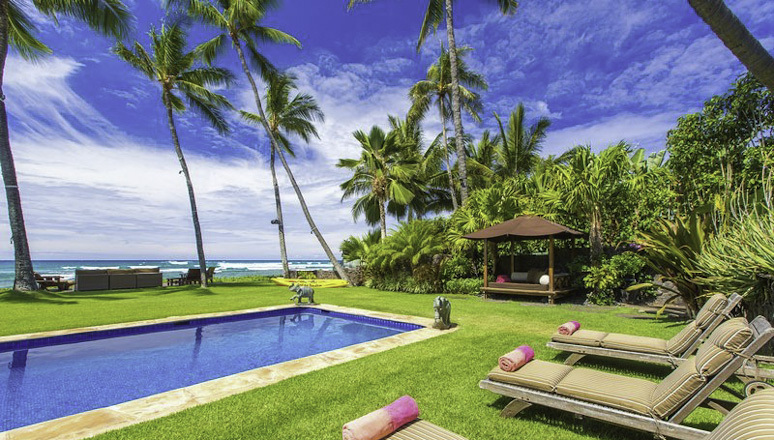 Kuai features low-key resorts in the most stunning locations. Best of all, the island is one of the least-crowded and offers a laid-back island vibe. Those luxury villas Kauai is home to are generally in lush, green settings and very, very close to a beach. It is the perfect place to relax and enjoy a Hawaiian Vacation. From the small towns of Hanapepe and Old Koloa Town to sunny Poipu Beach, Kauia truly is "Hawaii's Island of Discovery". Whichever island you choose for your secluded getaway, you will have a vacation of a life time. Our Hawaiian Villa Team will be delighted to assist you in first finding the perfect Hawaii Villa and then assisting you with your reservations and all your pre-arrival concierge requirements. If you want to know more about us, then browse through our website or check out our Facebook page for new updates, events, rates and reviews as well as exclusive deals! Visit our Instagram page if you want to look at our beautiful photos from a huge variety of our Villas. It is time to start booking the dates for your very own Hawaiian Vacation!